The current plan….as of Jan 3rd…. …got all tossed out the window. It’s now Jan 1oth. I was going to finish the current Galileo mitt, my Polar Chullo, continue working on Manzanita, and the current Lau sock…..then bring Manzanita & Lau with me on our trip to visit my parents in Austin. 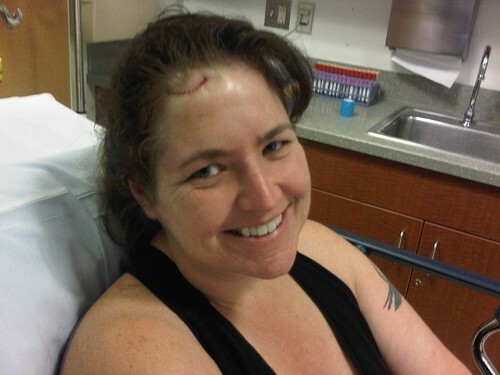 However, I ended up walking into a tree branch Tuesday (really) and ended up with a cut down to my skull & my first ever stitches. Kinda blew the whole day for knitting. So I didn’t finish the stranded items. I brought Lau (no problems getting through security with the metal circs) but actually never worked on them. Rather, I worked on writing up a new pattern (will probably put it out for test knitting today or tomorrow). We had a very nice, relaxing, lazy few days with my parents — very much needed. We flew home Saturday and I was feeling a bit sick. This morning I had a fever, muscle aches, etc etc. What fun. Better now. I’ve been chatting with some friends re: resolutions. I guess I don’t really think of them as resolutions, but rather as overarching goals. I do best, I think, when I revisit them monthly. So….goals for this coming week? Finish one Galileo mitt, finish the polar chullo, yadda yadda yadda. And get Sw’Elegant published & the new socks out for test knitting. From Lazy Kate Creates : some lovely Silkie STR in Space Dust (destined for a hat for hubby, with a name like that — Dave is totally into astronomy) and the book Blogging for Bliss (with some great tips and blog examples; it’s a book to browse while drinking a nice cup of tea, with laptop ready). From Darcy: some very cute Pirate gift tags, with a space for writing in fiber/fabric care.